Donald Duck would like to make a playground for his nephews, Huey, Dewey and Louie in Duckburg City Park. He will need to buy parts for the playground and, since Donald is broke, he will have to work to earn it. After working shifts at McDuck Airlines, the produce market, the toy store and the Amquack Railroad, Donald receives his wage and goes to the stores on the other side of Main Street to buy all sorts of playground items. His friends, Minnie, Mickey and Goofey each have their our goods for sale in their stores. Of course Donald will have to pay the exact amount and receive the correct change if necessary. When the working and shopping is done, Donald goes to the playground where he can set up the playground and watch his nephews play. 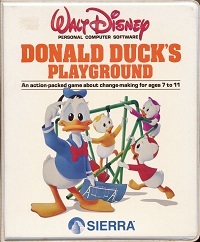 Donald Duck's Playground, designed by Al Lowe in cooperation with Disney Software, was first written for the Commodore 64 in 1984 and later on ported to Sierra's AGI interpreter for the Apple II, PC compatibles, Amiga, and Atari ST. A version for the TRS-80 Color Computer followed as well. As the AGI engine had not been designed for this type of game several of the game screens of the Commodore 64 release did not occur in the AGI release and vice versa. Most notably in the Commodore 64 release the toy stores feature close-ups of Donald's friends and an item window where as in the AGI release the toy stores are presented as large rooms with toys scattered around. Another notable difference is that in the Commodore 64 release the playground is shown on just one screen and can be fully modified where as in the AGI release the playground looks more lavish and the items are auto-placed upon their purchase. Like other games in the Sierra/Disney series, Donald Ducks Playground is an educational game for children. In this game children will learn the concept of "labor for pay", and enhance their money handling and mathematical skills, as well as matching and logic skills, while they entertain.